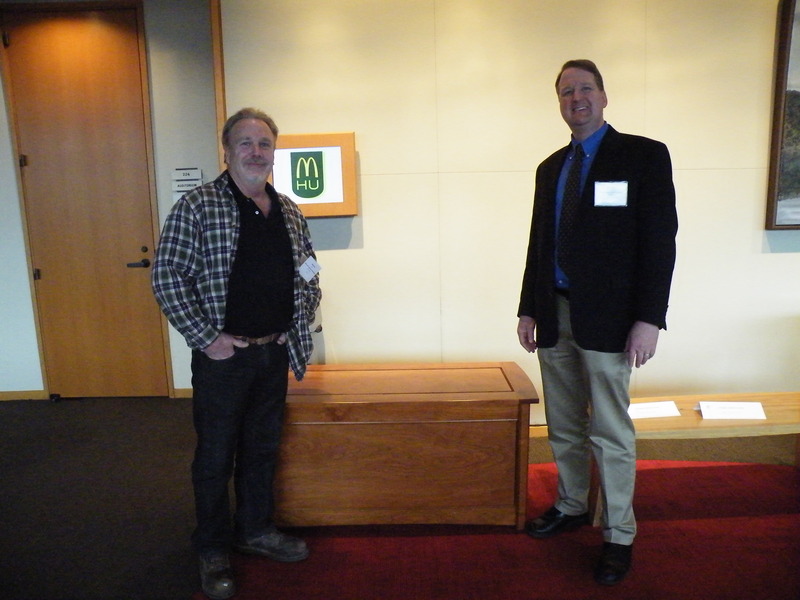 Wade Ellis, left, First Place Furniture, for his Cherry Chest, with John Lough, chair of the Urban Wood Products Showcase. Jeff Perkis, left, Second Place Furniture for his red oak bell stand, with John Lough, chair of the Urban Wood Products Showcase. 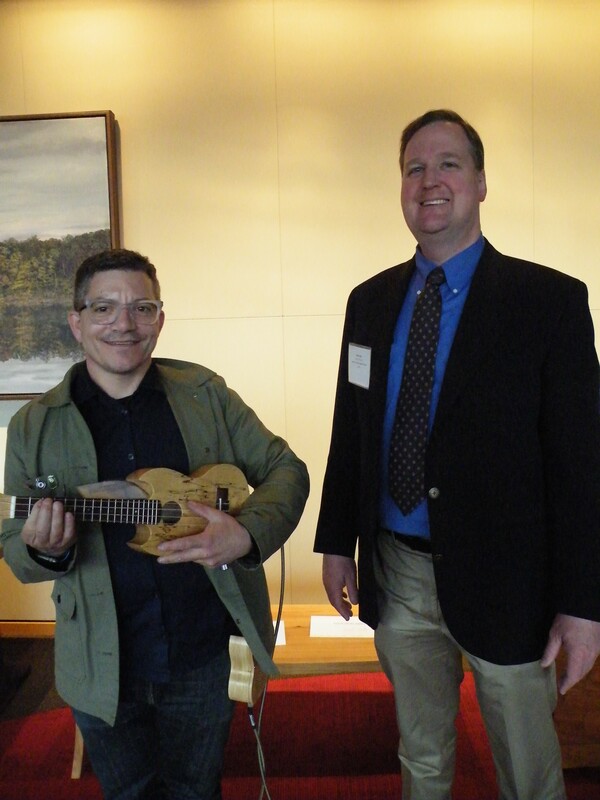 Paul Pettigrew, left, First Place Specialty Items for his electric ukulele, with John Lough, chair of the Urban Wood Products Showcase. 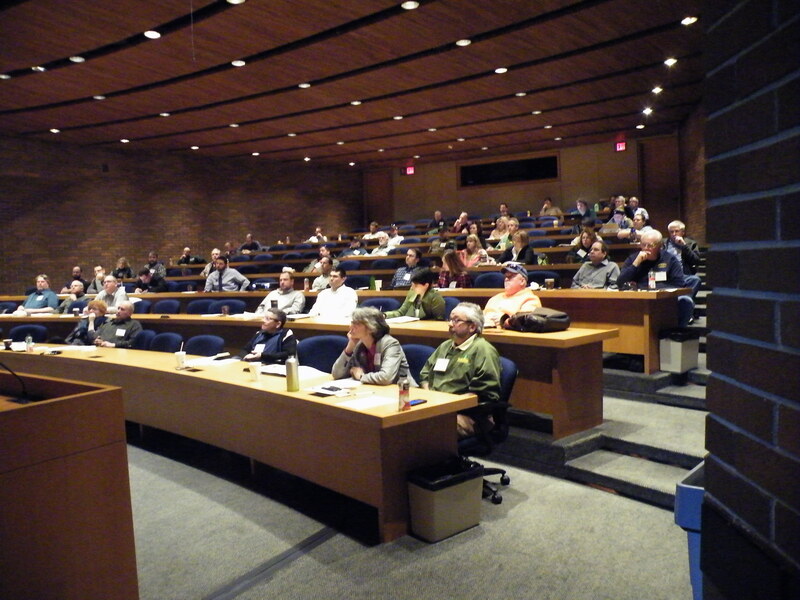 Among the many highlights of the Bringing the Urban Wood Full Circle Conference held March 18 at Hamburger University in Oak Brook was the Urban Wood Products Showcase. The showcase shined a bright spotlight on the design creativity of the entries that ranged from tables and wall hangings to a bell stand and soccer ball all crafted from urban wood. Nearly all of the entries also told a story about their lives as trees and their rebirth as functional and/or fun products. Conference delegates got to vote for their favorite products on display in the showcase. First and second place People’s Choice Awards were awarded for two judging categories: Furniture and Specialty Items. In the hotly contested Furniture category, Wade Ellis, owner of Ellis Custom Sawing and Woodworking of West Chicago, IL, took top honors for his gorgeous cherry chest. The chest was literally a last-minute entry. It took a strong write-in campaign to win first place. Finishing second was a bell stand designed and fabricated by Jeff Perkis, owner of Story Wood. 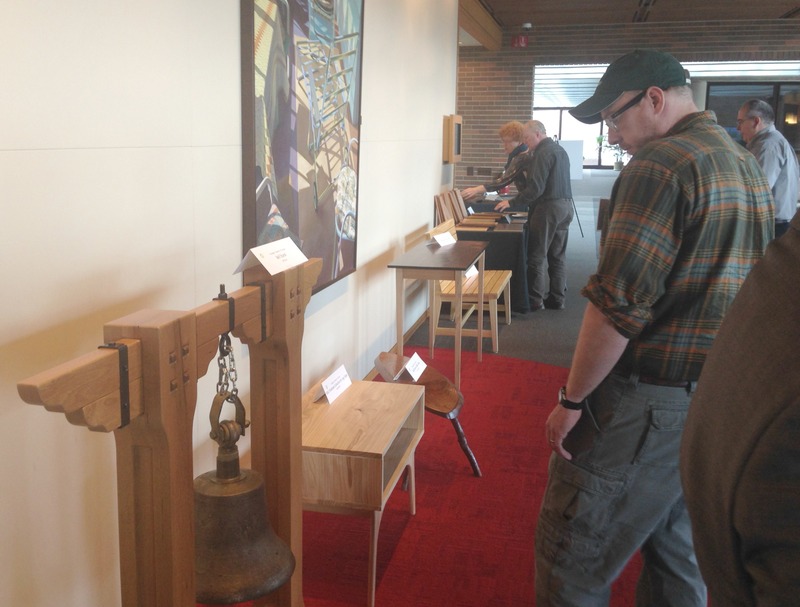 West Chicago City Museum, which maintains a record of the town’s railroad roots, commissioned Perkis to create the solid red oak stand with walnut accents to hold an old 80-pound train bell. Urban wood used for the project was salvaged from West Chicago community trees damaged in a 2012 storm. 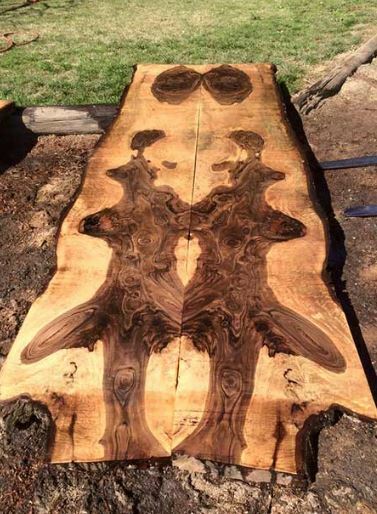 The wood was milled and kiln dried by Perkins and his uncle Ron Meyers of Meyers Woodworking & Lumber in Batavia, IL. 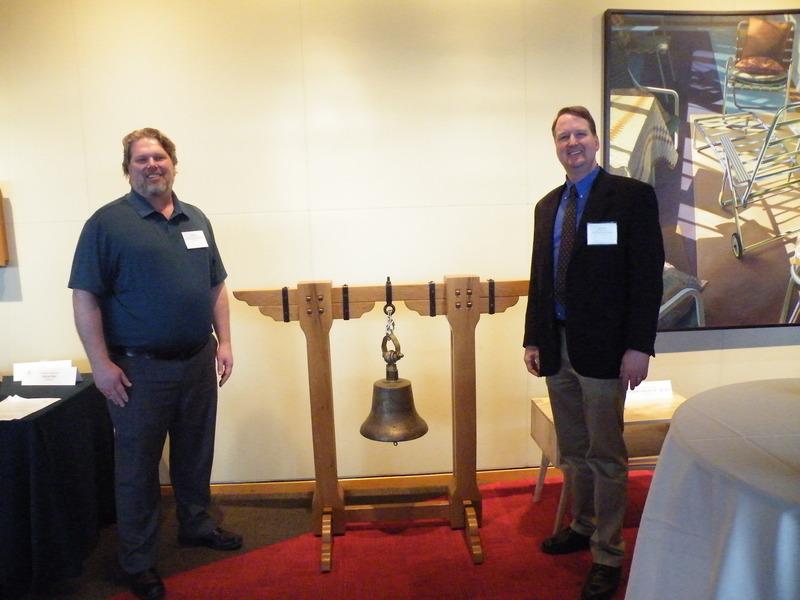 The bell was finished by Ken Wier, owner of i2i Design of Wood Dale, IL. Meyers and Wier were among runner ups in the Furniture category. 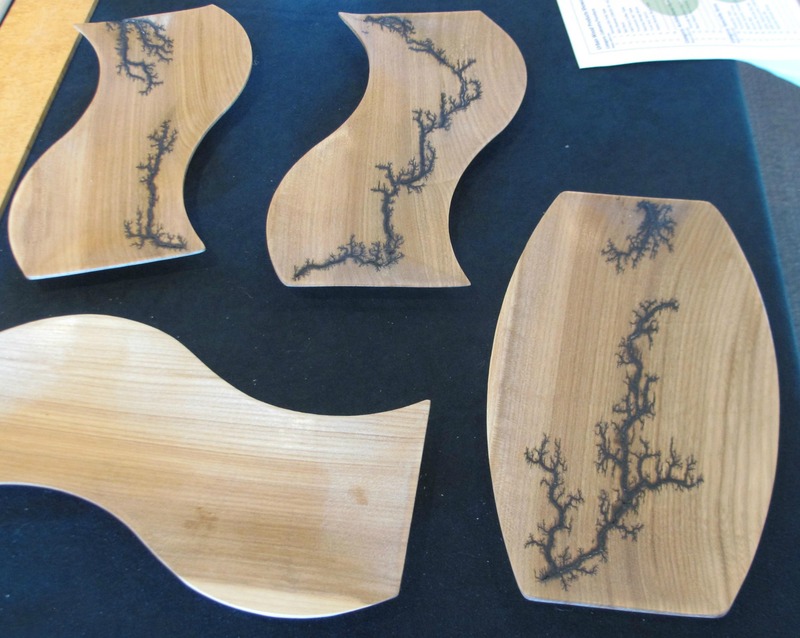 Eric Beauchamp of Beau Bois Custom Creations of Evanston, IL, took second place with a set of Fractal Elm Trays. Wood for the trays came from an American elm tree estimated at more than 130 years old that Beauchamp said “was cared for as the centerpiece of a garden in Evanston.” The tree was removed as a “safety precaution.” The main trunk, 14.5 feet long and 4.5 feet in diameter, was milled and kiln dried by Horigan Forest Products of Skokie, IL. 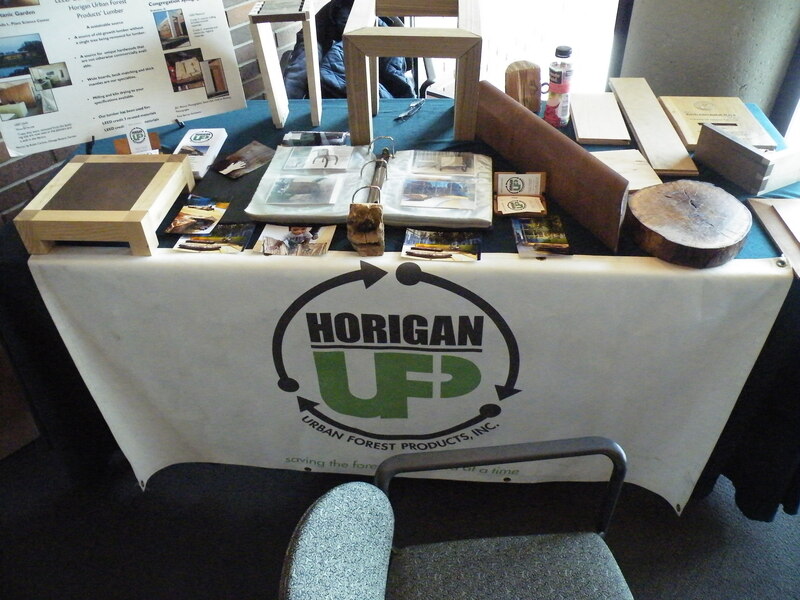 The Urban Wood Products Showcase was coordinated by John Lough, Senior City Forester of Chicago. Photos and information of all of the entries will be posted on illinoisurbanwood.org in the coming weeks. Dan Cassens prepares to cut a log on a Wood-Mizer portable sawmill. 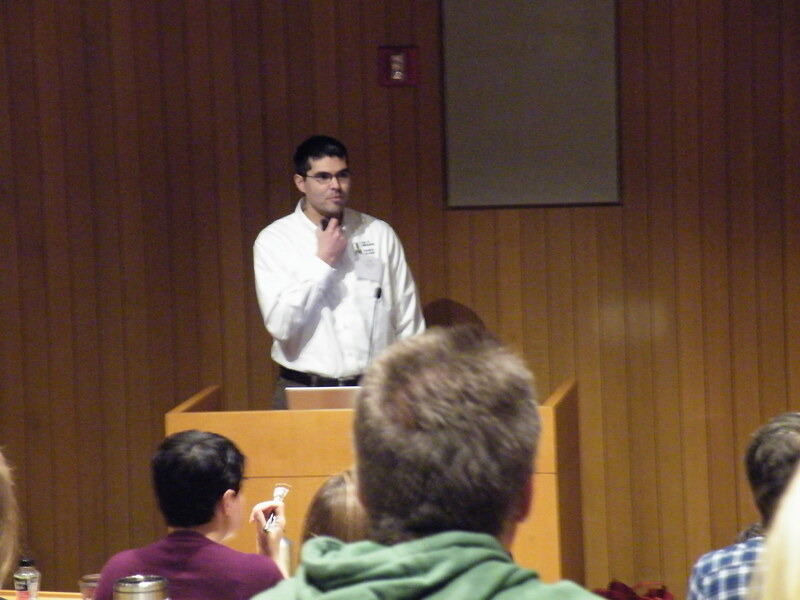 Prof. Cassens had an attentive group of students eager to learn more about hardwood properties and markets. 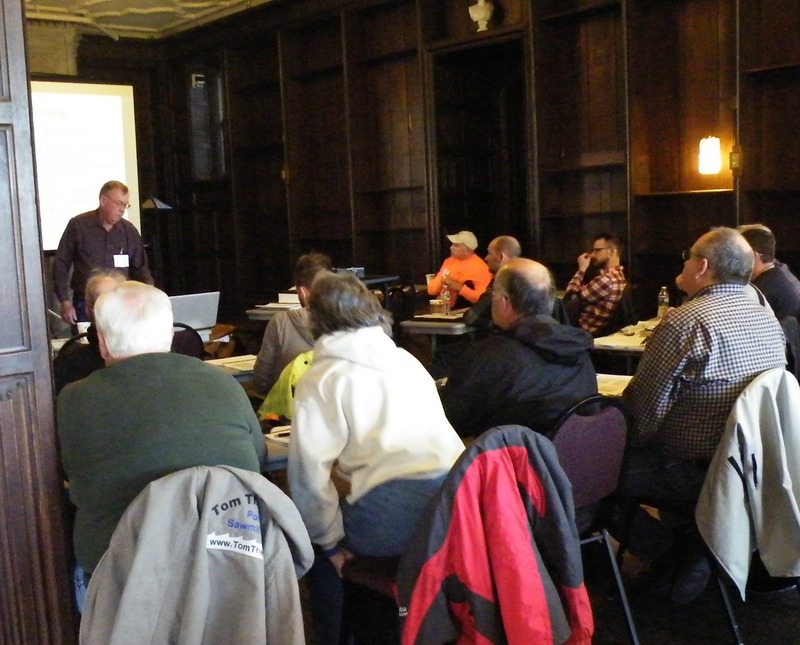 Attaining the most value from hardwood logs, including those harvested from the urban forest, was the running theme of the Hardwood Lumber & Sawmill Workshop held Thursday, March 17 at the historic Mayslake Peabody Estate in Oak Brook, IL. 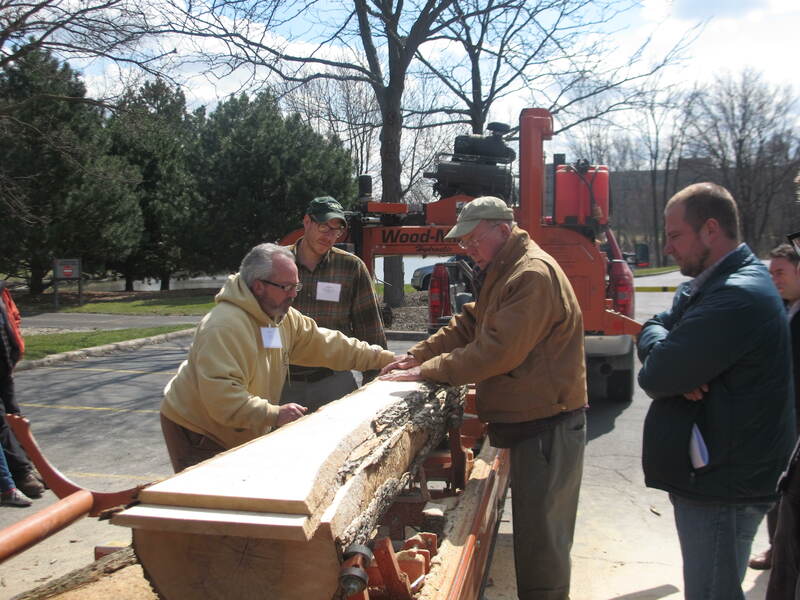 Prof. Dan Cassens, wood products extension specialist at Purdue University, and owner of Cassens Lumber of West Lafayette, IN, presented a mix of classroom and hands on instruction to an audience mostly made up of sawyers, woodworkers and arborists. Some of the classroom topics Cassens lectured on included wood quality and characteristics, log scaling, hardwood grading pricing and marketing, optimizing sawing patterns and wood moisture and drying. 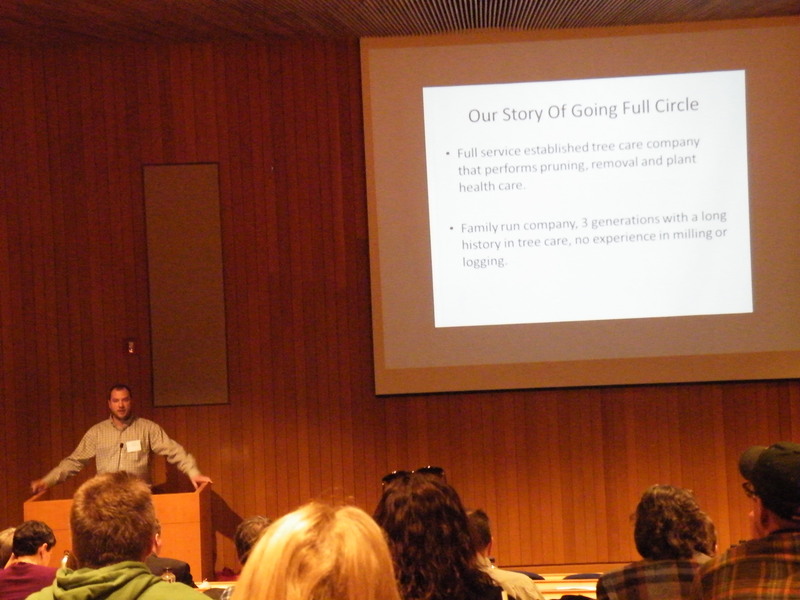 All of the topics were geared to helping nimble custom wood producers better understand how they can successfully compete in hardwood lumber and product markets. The classroom exercises were broken up by a mid-day sawmill demonstration. 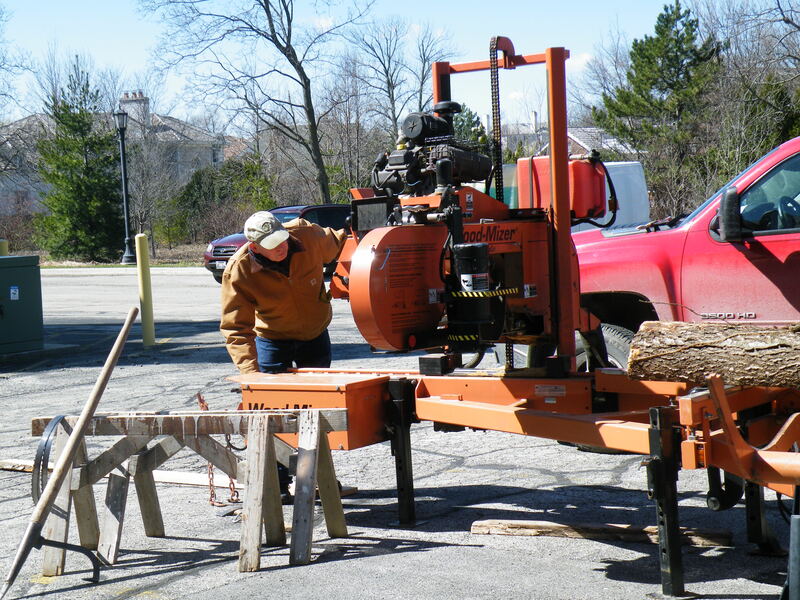 Cassens used a portable Wood-Mizer sawmill to mill logs provided by the DuPage County Forest Preserve into lumber. 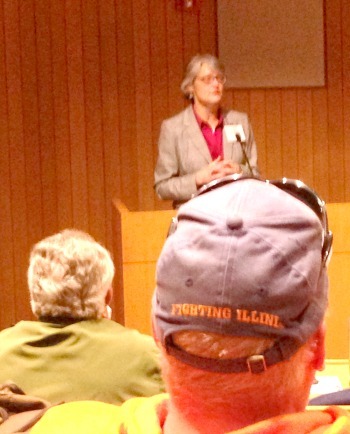 The workshop was organized by the Illinois Wood Utilization Team on the eve of the Bringing the Urban Forest Full Circle Conference. The Forestry Division of the Illinois Department of Natural Resources recently released a pair of newly updated sawmill directories, one featuring custom sawyers and the other dedicated to stationary sawmilling operations. The 2016 Illinois Custom Sawmill Directory, last updated in 2011, features 60 businesses located throughout the state. The vast majority of them have mobile sawmills and are involved in processing lumber from logs reclaimed from community trees. In addition to key contact information, the county-by-county guide includes information on specialty services offered by custom sawyers including kiln drying, timber inventories and secondary wood processing. 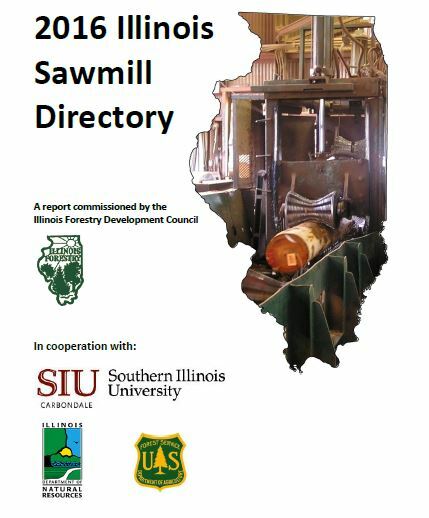 The 2016 Illinois Sawmill Directory, compiled with the help of Southern Illinois University and the U.S. Forest Service, is the first major update since 2013. The 42-page directory features listings of more than 70 sawmills with processing capacities ranging from less than 1,000 board feet per day to more than 16,000 board feet per day. Nearly all of the sawmills primarily process hardwoods, the most common of which is white and red oak, walnut, black cherry, and maple. Less than 5% of the sawmills process softwoods. Learn more about services offered by Illinois Forestry Resources. Icon Modern, a company that has staked its business model and growth on repurposing wood reclaimed from the urban forest for its custom furniture designs was recently the subject of a news feature on WBBM radio Chicago. WBBM reporter Lisa Fields interviewed Rocky Levy, co-owner of Icon Modern for the profile. Starbucks, Whole Foods and Loyola University are just a few of Icon Modern’s customers. Products include conference tables, reception desks and countertops. Click here to listen to WBBM’s report. Click here to visit Icon Modern. Hunski Hardwoods specializes in giving diseased and storm damaged community trees a second life. James Hunsaker and his son, Nick have been salvaging diseased and dying urban trees in and around Antelope, CA, since 2010. The father and son’s story was chronicled in Timberline magazine last August, a publication of Wood-Mizer. As the story goes, Hunski Hardwood’s business took off after it purchased a Wood-Mizer WM1000 sawmill. Within two weeks of putting the mill into operation, Hunski had milled 30 logs, tripling their lumber output in the process. Read the Timberline article for more about Hunski Hardwood’s business and growth and/or visit hunskhardwoods.com. Online registration for the March 17 Hardwood Lumber & Sawmill Workshop and Brining the Urban Forest Full Circle Conference remains open through Wednesday, March 16. Best yet, take advantage of the Daily Double Discount Package to save an additional $45 to attend both programs.. The Hardwood Lumber & Sawmill Conference is limited to 50 attendees. The program, presented by Prof. Daniel Cassens of Purdue University’s Department of Forestry, is scheduled for Thursday, March 17 at the Mayslake Peabody Estate in Oak Brook. The workshop is being presented in special partnership with the DuPage Country Forest Preserve and the Illinois Wood Utilization Team. The classroom of the workshop will include presentations on lumber grading, milling strategies and drying. The program also will include a portable sawmill demonstration. The $110 registration fee includes lunch and beverage breaks. Click here to view the workshop schedule and to register. 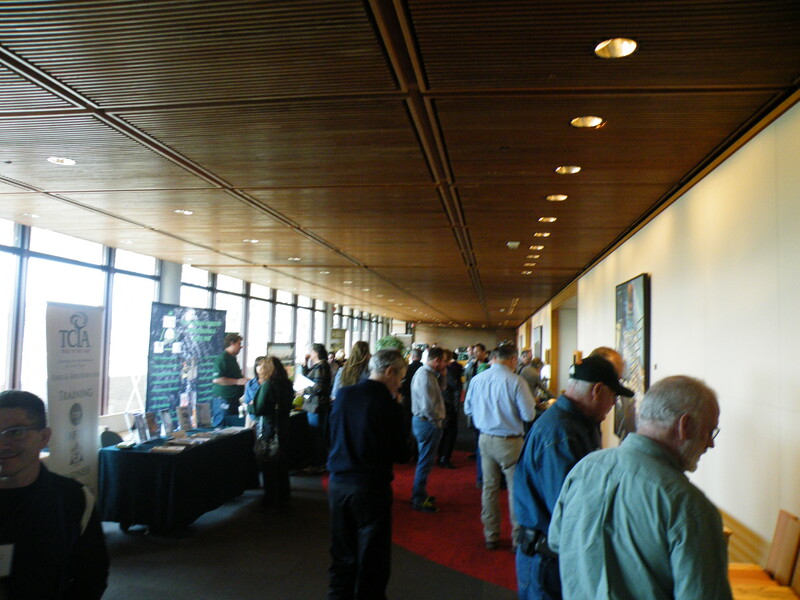 Organized by the Illinois Wood Utilization Team, the conference has the support of Horigan Urban Wood Products, Wisconsin Arborist Association, Sterling Tree Solutions, Meyers Woodworking & Lumber, American Society of Landscape Architects – Illinois Chapter, ElkhartWood, Illinois Arborist Association, Illinois Sustainable Technology Center, International Woodworking Fair, Metropolitan Mayors Caucus, Tree Care Industry Association, Urban Wood Project of Southeast Michigan and USDA Forest Service. Contact Rich Christianson, Conference Director, richc.illinoisurbanwood@gmail.com; 773-822-6750.